Low in fat, you can serve as a main or a side dish. Heat the oil in a flameproof casserole, add the onion and garlic and cook over a gentle heat for 3 minutes until soft and golden, stirring regularly. Stir in the cinnamon and tomato puree and cook for a minute. Stir in the rice until coated in the oil. Add the stock or cold water, season and bring to the boil. Cover and simmer gently for 12 minutes until all the liquid is absorbed. 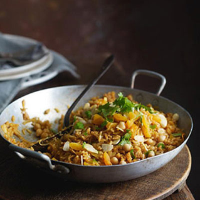 Add the chick peas, apricots and almonds, re-cover and cook gently for a further 5 minutes until the rice is tender then stir in the chopped coriander and serve. This dish makes a complete vegetarian meal but also works well as an accompaniment to grilled meat such as lamb or pork.